Modern detached house for rent in COMPOUND with perfect club house, garden in HABITIA Watcharapol Ramindra, near Sukhaphiban 5 expressway, utility area of 150 Sq.m., 3 bedrooms, 2 + 1 bathrooms, master bedroom with balcony & walk-in closet, the interior is designed to allow more light and ventilation through the house, lawn area around the house ... Superb living. Please be sure if its location is acceptable. Wide opened Living & Dining areas with big windows around, Pantry with overhead cabinet, Store room, restroom, enclosed kitchen. Master bedroom with balcony, walk-in closet, bathroom with shower, 2 bedrooms, shared bathroom with shower. 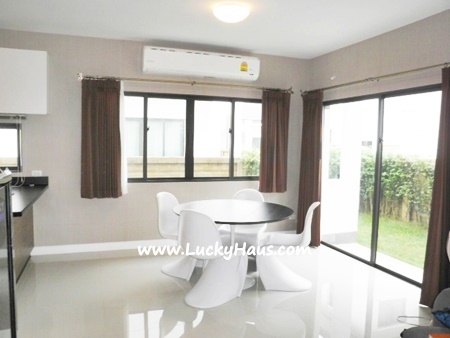 Welcome to LuckyHaus Bangkok realtor. We are a Thai professional real estate agency in Bangkok. We strongly believe that we can give you the best advice on property for rental, purchase or sale. READ ABOUT US so you will know how we are. For vistor looking to rent or purchase a property, just go straight to the lists, click at SEARCH or ADVANCED SEARCH. Do you find some places you like? if not, please CONTACT US or EMAIL US; info@LuckyHaus.com, so we may find the right property for you. Please enjoy to browsing the rest of our site and contact us with any Queries that you may have. Have a nice day. © 2017 LuckyHaus. All rights reserved.